On Friday night, the Los Angeles Lakers took on the Oklahoma City Thunder inside the loud, Chesapeake Energy Arena. In a game in which some might have thought Kobe Bryant would go off, and that this would be a close and exciting game, those people's predictions were way off, as this turned out to be a big-time blow out right from the start. In the first quarter, both teams got off to a hot start, but something I noticed was Kobe was trying to maintain a very fast-paced offense from the tip-off. While Bryant got his teammates involved early, he was barely attempting any shots. His game was lopsided, as he wasn't able to both pass and score at all throughout the whole game. What I also found interesting was that he played just 23 minutes. The Lakers fast-pace offense from the start of the game didn't hinder the Thunder in any way though, as the Thunder were easily able to build a lead, making their lead 38-28 just at the end of the first. Oklahoma City never looked back, as they continued to pile on their huge lead even more. By halftime, you knew it was over. The Thunder went on to crush the Lakers 122-97, and the crowd was a huge reason for the win. Because the Lakers had no point guards left, all out with injuries, Bryant had to start at the point guard position. And that didn't really work out. While he was passing the ball well and getting his teammates involved with 13 assists, Kobe finished with just 4 points and one rebound. Another negative to his performance was turnovers, as he turned the ball over seven times. It will be interesting to see how this Lakers offense works moving forward with the Black Mamba playing the point guard position. With Kobe at PG, the offense just doesn't click as it used to, and he is definitely going to have to make adjustments for this offense to be successful. I'm intrigued to see if Kobe continues to take a less amount of shot attempts now that he is forced to pass the ball with this new position for him. The Thunder offense was absolutely dominant in this game. The Thunder finished with 34 assists, and I was very impressed with the involvement each teammate received. OKC took care of opportunities given to them, and converted off Lakers' turnovers. 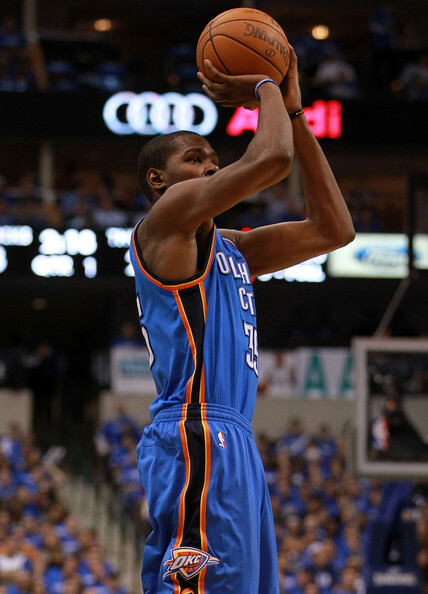 Kevin Durant led all scorers with 31 points on 10/13 shooting from the field, along with 4 steals, 5 assists, and 8 boards. Russell Westbrook scored 19 on 7/19 from the field, dished out 12, and grabbed 8 rebounds. Westbrook and Durant were a sensational duo together Friday night. Everything was clicking for them. Serge Ibaka and Reggie Jackson finished with 19 as well, and Jeremy Lamb chipped in 11. The Thunder are now 18-4 and an undefeated 11-0 at home. The Oklahoma City Thunder are looking like legit contenders right now, and no one seems to be able to slow down the dynamic duo of Westbrook and Durant, as well as this explosive offense.